Da dum da dum dadum dadum dadumdadumdadumdadum. Have you see the movie Jaws? Read about the shark attacks that inspired Peter Benchley to write the book that was turned into the movie that made you want to stay AWAY from the shore. It was summer 1916. People flocked to the beaches of New Jersey, anxious to escape the heat by taking a nice, cool dip in the ocean. Ocean swimming was becoming more and more popular. And man-eating sea creatures? Pah. They didn't exist. Science was the new rage with new scientific discoveries happening all the time. The "myths" of man-eating sea creatures were happily dismissed as people congregated in the cool, ocean waves. A lone shark, possibly ill or injured, began appearing on the Jersey shore. It attacked one. People said that maybe it was a killer whale, a swordfish, or a tuna, surely not a shark. Sure not one of those big fish that scientists said would not harm a human... But then it attacked more... And soon the shark hysteria was making its way up and down the coast. The people of New Jersey demanded help. Hotels remained empty, the beaches were desolate. Small towns were dependent on the money that summer tourists brought it, only now people were afraid to come. Something had to be done... but what? Capuzzo's penned a captivating true story of a man-eating beast and how it changed the public and scientific view of sharks. Humans thought the ocean was their playground, that they had nothing to fear. But all that changed in 1916 on the Jersey shore. Adapted from his adult book (Close to Shore: A True Story of Terror in an Age of Innocence), this book provides an interesting glimpse into life in a different time and it also provides a glimpse into the psyche of a shark. Capuzzo alternates chapters about the human reactions with chapters told from the (possible) point of view of the shark. It's perfect for young marine biologists and shark enthusiasts. 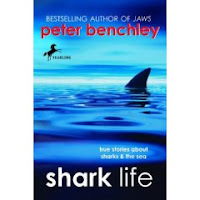 Pair it with Peter Benchley's Shark Life: True Stories About Sharks & the Sea, another great book about unraveling the mysteries of great fish in the deep. Happy Nonfiction Monday! Check out the roundup at Picture Book of the Day! 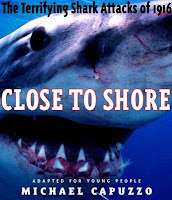 (ETA 4/22/08): PS: Check out this awesome booktalk for Close to Shore and another shark-related book, Soul Surfer, over at Bookwink! What an incredible front cover -- so real and scary! I want to read this personally, but do you think it's a stretch for 5th graders? i saw you recommended it for grades 6 - 12. Karen, I think that if the subject matter is appealing it would be no problem for a fifth grader. The reason I recommended it for slightly older kids is that it's pretty text-heavy and a big chunk of it is historical information about what was going on in 1916. Oooh! Thanks for commenting and posting that link. I'm totally going through your entire site when I get home from work tonight!